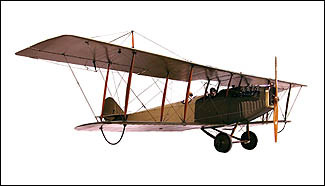 The JN-4 was America's most famous World War One airplane. During the war it was the main training plane of the Air Service. In 1917 and 1918, the JN-4 was used extensively on Long Island for training at the Army airfields here. After the war many were sold as surplus to pilots who flew them throughout the country, landing in fields, where they offered rides for a price. These pilots were called "barnstormers". In 1923 Charles Lindbergh purchased this aircraft in Americus, Georgia for $500. It was the first aircraft he ever owned. During the next two years Lindbergh barnstormed throughout the midwest. He experienced two crashes in this plane, which he repaired himself. It was later sold, crashed and ended its days in a pig barn in Iowa. George Dade, local aviation enthusiast, purchased the plane, and had it restored in his basement in the 1970's. 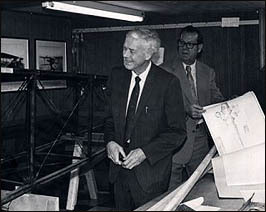 Lindbergh came to view the restoration and he verified that it was indeed his old Jenny. 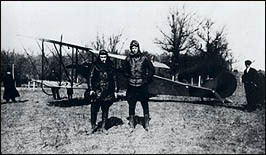 Lindbergh, right, with is JN4 during barnstorming tour.